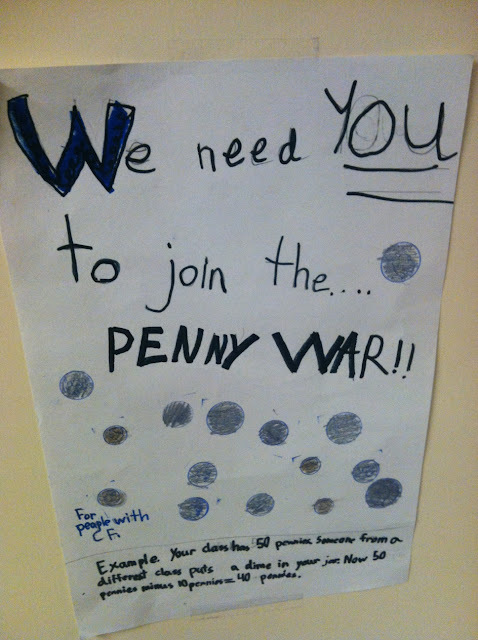 At the end of this year's school year, Oliver's school spent a week to raise money to find a cure for Cystic Fibrosis. It was very special for our family to have such young children work so hard to raise money to help Bennett. The second grade class sponsored the "Penny Wars" fundraiser so they made signs telling the other students why they were raising money for CF. Each morning, during the whole school meeting (called "Town Hall"), Oliver's principal made significant efforts to help teach the students about Cystic Fibrosis and why helping others is important. One morning, one of the second graders' brother (who has CF) came and talked about his fight against the disease. Another morning, the school showed Bennett's most recent Great Strides video which tells about Bennett's CF. To my surprise, several of the children were very touched by all of this CF talk in the school. One of those children is kindergartener Eric (pictured with his younger sister, Meg) who asked his mother if he could have a Lemonade Stand to raise money for Cystic Fibrosis. How adorable is that?!? Together (with the help of their mother), Eric and Meg raised $127.00 one afternoon. 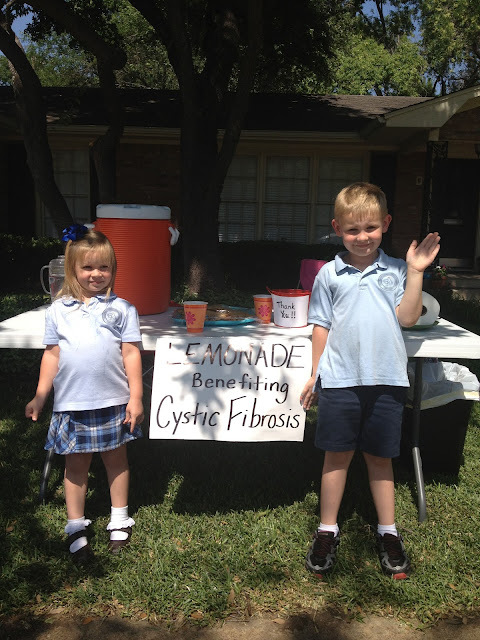 In total, the children at Oliver's school (ages 2-13) raised $1300 for Cystic Fibrosis. But more important than the money they raised was how much people were touched by all of their efforts, including our family. How blessed we are to have such a sweet community to support Bennett. There is something so beautiful as a child's heart. Our little friend Cody recently said to me, "Mrs. Gamel, do you ever wish Cystic Fibrosis wasn't alive?" Yes, Cody, I do. But it's little people like you who give us hope there may be a day when there is no Cystic Fibrosis. Thank you to Oliver's school and all the children (Mom and Dads) who helped us raise money to find Bennett a cure.